Election Night Results — Sue Peters leads by 51-48 percent! Election Night brought good news for my campaign — a 51-48 percent lead! More ballot tallies will be announced each day by 4:30 p.m.
We had a great party at the Tin Lizzie Lounge in the historic MarQueen Hotel. 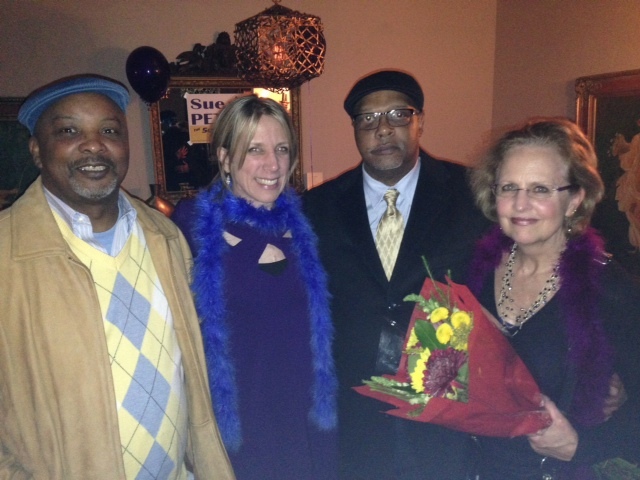 Celebrating the first returns with friends at the MarQueen Hotel, Tuesday night. Election Night: The Empire Strikes Back! It is a dark time for rebellious liberals. Although they won the mayor’s office and school board in elections past, wealthy forces seek to drive the interlopers from City Hall. Mayor Mike McGinn, Council Member O’Brien, and brave school board hopeful Sue Peters are running formidable campaigns to maintain their progressive foothold. But state senator Ed Murray, the rabidly conservative police guild, and grazzilionaire Nick Hanauer—obsessed with the politics of division and a scourge of crime—have deployed wealthy PACs to stop the insurgency and reclaim the government. KUOW reporters are on the ground at several campaign sites in Seattle, sending back snapshots from the scenes as the ballot countdown nears an end. 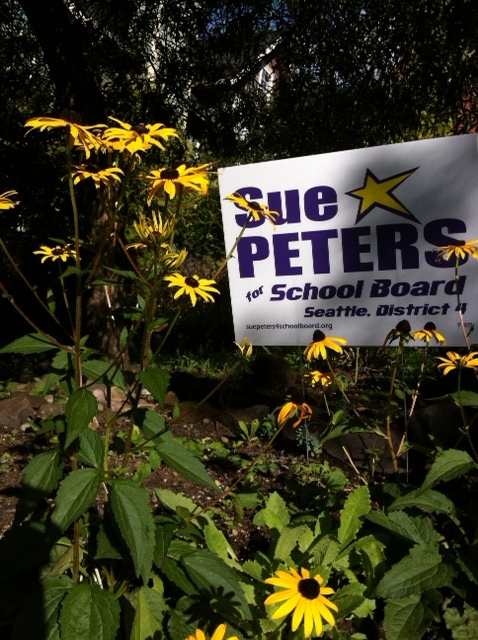 Seattle School Board candidate Sue Peters is wearing her lucky blue feather boa tonight, and it appears to have paid off. When King County released its first round of vote results, she was ahead of opponent Suzanne Dale Estey. Estey received 48 percent of the vote. At Peters’ party, it’s a mostly middle-aged crowd milling about the room, drinking wine and cocktails. There are purple balloons, sandwiches and cured meats. It’s a festive mood. It’s less festive at Estey’s campaign party, where there’s a sparser crowd and most of the guests appear to be drinking water.